What are your plans for this Holiday Season? Does it bring up images of cuddling by the fire, sipping eggnog and listening to Bing Crosby while the snow gently falls outside? While that does sound nice, how about bucking tradition and doing something different this year by going on a beach holiday this Holiday Season. I can give you at least 5 great reasons why it makes perfect sense to give yourself a gift and get away this year with a Happy Beach Holiday. One thing that always marks the season for me is the crowds. Christmas brings the shoppers out of the woodworks, and it seems like they are all in rush. I have met ragged holiday shoppers with the cold look of desperation in their eyes, and it scared me. But this year avoid the crowds by heading to the beach. While everyone else is shopping at a frenzied pace, go out and relax on the shore. Sure, it might not be typical hot beach weather, but many places are still nice enough to visit this time of year. The best part is that I have yet to find a shopping mall on the beach of your choice, so leave the crowds behind this Happy Beach Holiday. Now I know this may sound just a little cold, but sometimes everyone needs a break from the usual Yule Tide gatherings. There is nothing wrong with taking a little me time and enjoying the holidays on your terms, and by planning a Happy Beach Holiday you have the perfect excuse to not do the usual family gathering. All you have to say is that you paid a deposit or prepaid for the trip and can’t get out of it. You can always Facetime at some point during the holiday to wish everyone well, and by that point, you just might make a few people envious of your situation. What a shame they couldn’t be there with you. But whatever you do, no invites should be offered – this is your Happy Beach Holiday. A lot of people that take time off during the holidays show back up to work mentally and physically exhausted after their time off. But with a Happy Beach Holiday, you will actually get a creative boost. Scientists believe that an open blue space helps to clear your head and promote a feeling of calmness. Just like meditation, the beach helps to tune everything else out and recharge your mind. And while I know that you try to tune out Aunt Martha every Christmas as she tells you about the latest escapades of her cats, this is much better. While you are on your Happy Beach Holiday, release your inner kid and build a sandcastle. The act of a creative project with no predefined rules will allow your mind to run free as you think of new ways to build your dream castle. This is the kind of thinking that you need to tackle tough projects, but far too often it is not allowed to happen due to project constraints. And like any muscle, you need to flex it every once in a while, so build away, preferably without any preconceived notions as to what you want to build. The more you just let it flow, the better the creative boost will be. While we like to think that we are a civilized race of smart creatures, the fact is that painted walls and potpourri scents are not a naturally occurring thing. But the beach is as natural as it gets, and you should find it much more relaxing. Dipping a toe in the cool ocean wave will melt stress like hot Christmas lights on butter, and soon you will find that your problems have floated away. And of course, you might want to look your merriest with our tips for the best beachwear for you. If we keep doing the same thing each Holiday Season, then soon the only thing that will tell the yearly pictures apart from each other will be from wallpaper changes and losing family members – this is not how you want to mark your holiday seasons. Instead, make new memories by doing something special along the way. 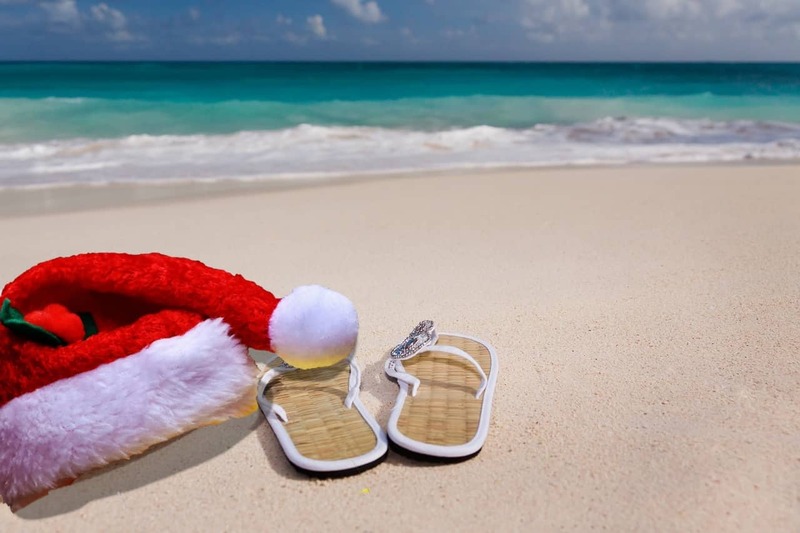 Sure, maybe next time you do a traditional holiday trip you will find your mind escaping back to the beach, but that is the gift of great memories. It will also give you an escape from the current holiday since you can be secretly planning you next Happy Beach Holiday while everyone else is singing Christmas Songs in the lost key of awful. As you can see, there are at least five good reasons as to why you should consider bucking tradition and have a Happy Beach Holiday this (or next) season. It probably would be nice to look forward to escaping off to your own holiday beach escape instead of looking forward to escaping the usual holiday trip and getting back to your regular life. That sounds like another good reason to me, so sign me up for a holiday beach escape. Going to a Party this Holiday Season? Don't Forget a Hostess Gift!